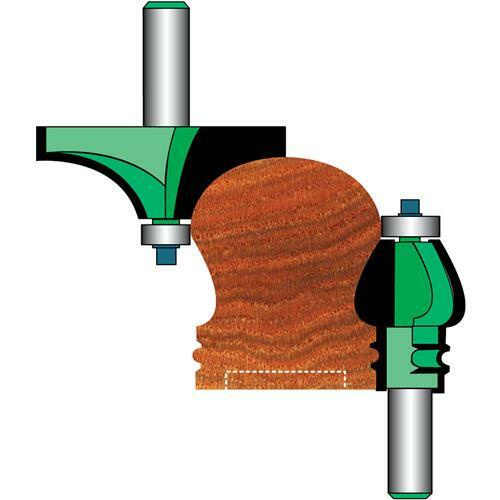 We developed this router bit set for making handrails with your 3 HP router. These bits are a must if your job calls for curved handrails or custom handrail fittings. These bits may also be used separately to create decorative mouldings and trim. Complete with guide bearing. Our cutters feature top-quality carbide - the best available for wood cutting applications. Shaped and sharpened with diamond wheels as fine as 600 grit, these outstanding router bits are constructed with a high-tensile, silver-based brazing material, which offers the utmost in strength and durability, If you haven't tried these premium bits, we strongly suggest you put them to the test. I used this set to make handrails out of white oak. I used in a shaper with a power feed on the slowest setting. I ran the round over bit in one pass then made three passes with the side bit. I would do two cuts with the round over if doing again I Had a little tear out. Handrails look great. Started with stock 23/8 wide x 2 1/2 deep.